Harry Williams, famed pinball designer and founder of the Williams Manufacturing (a major player in the electromechanical pinball era), produced a lot of games over his long-lived career, for a variety of companies he owned, worked for, or contracted with. One small, and poorly understood, instance of this involves Bally Manufacturing Corporation. Harry did a few game designs for Bally in the 1930s, but all his efforts predated the foundation of Williams Manufacturing (and flipper pinball in general), except for two traditional pinball games. The first was Firecracker, which Bally released in February 1971 (production: 2,800 units). The second, on Firecracker’s heels, was Skyrocket, released in May 1971 (production: 545 units). 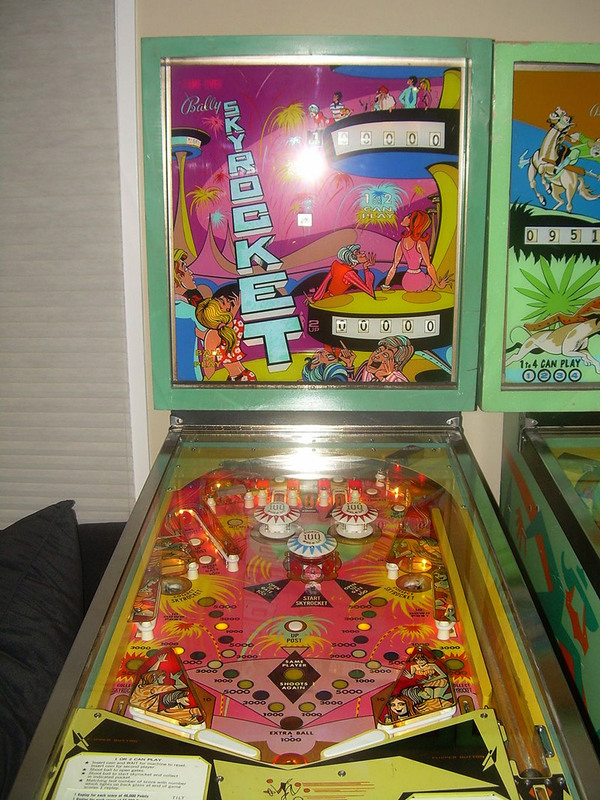 Firecracker was the first traditional pinball machine Bally produced with a Harry Williams designPicture: David Peck That was it. Harry had games produced later on, mostly by Williams and Stern Electronics, but never again by Bally. Why? It should be noted upfront I have no confirmed answer here, and multiple factors may have been in play. However, based off historical records, I believe the issue fundamentally comes down to the friendship between Harry Williams and Sam Stern. First, some context is required regarding the relationship between Sam Stern and Harry Williams, as they have a long history together. Sam Stern went to Harry Williams in 1947 and purchased 49% of Williams Manufacturing from Harry. Sam and Harry became friends, and Harry continued designing at Williams throughout the 1950s while Sam focused more on the business aspects of running the company. Sam then arranged for a buy-out of Williams in 1959 (Harry took cash for his share of the company, while Sam took stock in Consolidated Sun Ray, the purchaser). Harry left at this point and formed Southland Engineering while Sam became president of Williams (versus his role as vice president during the 1950s). Williams became independent from Consolidated Sun Ray in 1961 (Sam Stern owned it at this point), and eventually (in 1964) was acquired by Seeburg (of jukebox fame; Sam Stern accepted Seeburg stock in exchange for ownership). According to Williams pinball designer Steve Kordek, Sam Stern felt embarrassed about aspects of buying Harry out in 1959 (Kordek indicated it was regarding the amount of money). Sam allowed Harry to continue to develop pinball designs as an external contractor and submit them for possible production by Williams. Kordek had no interest in building Harry’s designs (he did recall using one of them, however). Kordek was brought to Williams as Harry was departing the company, and Kordek (being an established designer in his own right from his time at Genco and a brief stint with Bally) had ideas for games. Kordek did not see the point in building Harry’s designs when he could build his own. Kordek did save Harry’s designs over the years, resulting in a treasure-trove of playfield design content available due to those preservation efforts and the work of Duncan Brown to obtain them. So, Sam Stern had a long-running interest in allowing Harry to provide designs for the company he was running (though, as the records indicate, he did not mandate Kordek actually manufacture those designs). This is where I believe the Bally angle fits in, as Sam, ever so briefly, worked for Bally. As noted above, Seeburg acquired Williams in 1964. Sam Stern’s contract with Seeburg ran until 1969, and due to Bally’s activities and growth Sam decided to join the company (Kordek indicated Sam was fired from Williams, so the departure may have been less voluntary than some biographical summaries suggest). Sam filled an executive vice president slot, and stayed with Bally for a year. He returned to Seeburg (and thus Williams) in 1970, and stayed there until 1976. Skyrocket was the second, and final, traditional pinball machine Bally produced with a Harry Williams designPicture: Kory Hankin Looking back above, one is probably noticing that Firecracker and Skyrocket were manufactured after Sam Stern left Bally (as both games were produced in early 1971). However, as the Internet Pinball Database (IPDB) details reveal, the project dates were when Sam appeared to still be present at Bally (Firecracker has a project date of July 27, 1970, and Skyrocket right after with a project date of August 3, 1970). Given Sam’s interest in accepting designs from Harry while running Williams, and the syncing of these production timelines with Sam’s short tenure at Bally, it makes sense to think that Sam was able to get a couple of Harry’s designs into the production pipeline (and as we’ve seen numerous times in pinball, it is not atypical to see manufacturing of a game happen after those involved with the project have moved on from the manufacturing company). It would also explain why it did not happen again after that point (as Sam’s return to Williams meant he was no longer at Bally to push for Harry’s designs). I reached out to Duncan Brown (mentioned earlier regarding his preservation efforts in the Harry designs Kordek saved but never used at Williams), inquiring about Harry and his Bally pinball designs. 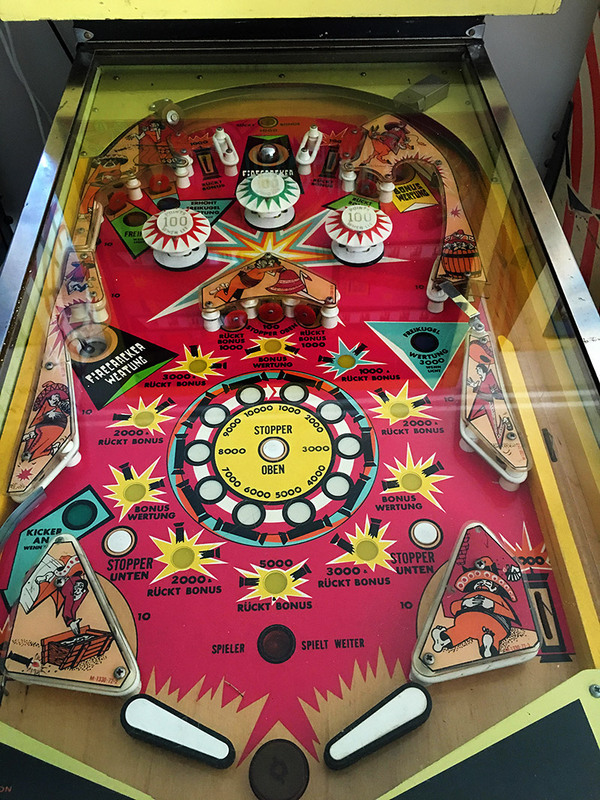 Brown indicated that while these Bally pins do predate what he considers the official lost playfield designs, Firecracker is actually included in the collection, and originally had the name Scramble. Brown did a comparison and confirmed the design is indeed identical to Bally’s Firecracker, which raises interesting questions as to why Kordek had them. 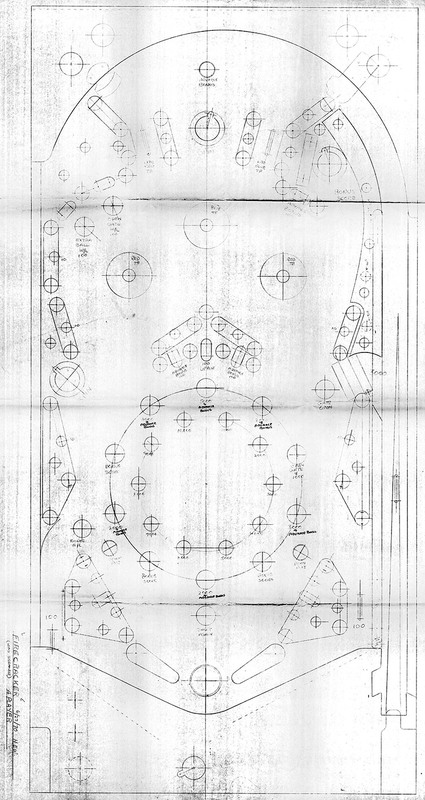 The playfield design of Firecracker (originally Scramble) by Harry Williams, from Steve Kordek’s collectionScan: Duncan Brown I listed designs, plural, because while Brown did not find Skyrocket amongst the documentation, he did find two other interesting examples. There is a Harry design for a game called Samoa, which Brown noted is highly similar (but not perfectly identical) to Bally’s 1971 Sea Ray, which is credited as a Ted Zale design at IPDB. Note that, much like Skyrocket and Firecracker, while Sea Ray was produced in 1971 its project date is September 30, 1970. Another game, Bally’s 1973 Bali-Hi, matches another Harry design with just slight differences (same name in the design as well). Bali-Hi’s project date? September 14, 1970 (and like Sea Ray, IPDB credits to Zale). Brown’s playfield records indicate Harry worked on all these designs in June 1970, and that they were Bally templates (so Harry did intend these games to be made by Bally, not Williams). The IPDB project dates in 1970 confirm official acceptance by Bally of the designs. Additional Harry/Sam activity lends credence to this theory. Harry had more games produced by Williams, but only after Sam Stern returned. Sam Stern left Williams again in 1976 when he started up Stern Electronics. As fans of those games know, Harry Williams had numerous designs produced by Stern Electronics (providing yet another link between the two). So, while it is a bit curious to see a couple pinball games from the early 1970s out of Bally with Harry Williams given design credit, it appears his friendship with Sam Stern was the driving force behind why it happened. All this is just circumstantial. I did not find any historical record or interview that specifically addressed the formal reasoning Bally had to run with Harry’s designs. Nonetheless, it is an interesting pinball tidbit, and given what the pinball community knows about the relationship between Harry Williams and Sam Stern, I think there is enough convergence on the project dates and Sam’s employment with Bally to suggest it to be the primary factor for this interesting fluke of pinball design history.